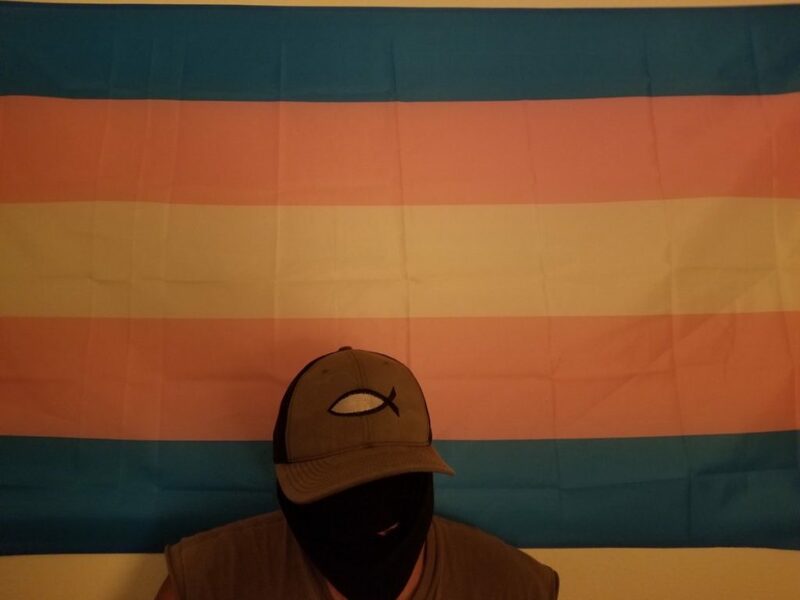 Please consider donating to the legal and medical fund here set up for anti-fascist comrades nursing wounds and facing legal repression. and his group Patriot Prayer. ** They are essentially a big tent reactionary American conservative coalition who play up a sort of respectability politics in the media and try to obscure their ultra authoritarian and racist ties while using Free Speech as a Trojan Horse for bringing in far-right brawlers and networking a violent reactionary movement emboldened by Trump’s election that hopes to attack marginalized groups in the street and via political power. 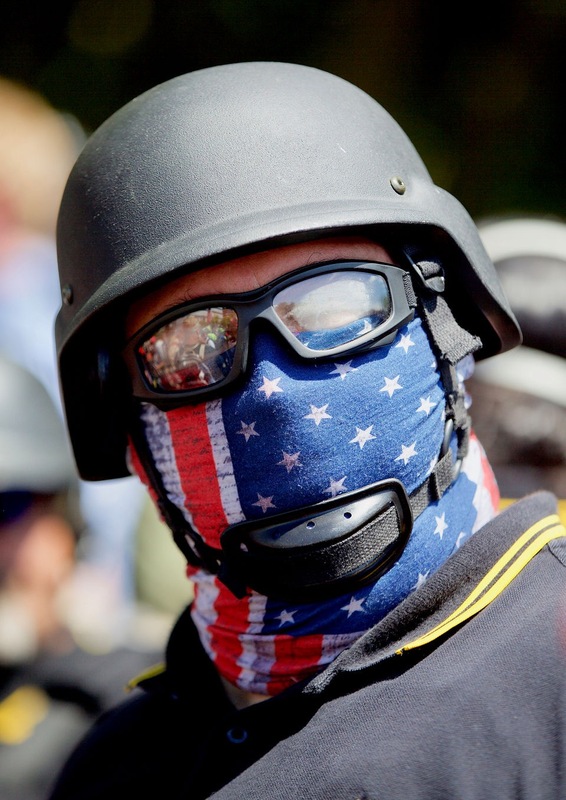 Though Joey may be scrambling to spin and play down the bigoted or authoritarian aspects of his movement, on the ground his group makes room for murderous agendas and beatings of radicals or oppressed people that aren’t subserviently Patriotic or repressively normal by their own formally affiliated members like Tiny, allied groups like the Proud Boys***, and more informally affiliated or unaffiliated bigots including, but not limited to, Neo-Nazis. On August 4th these reactionaries came out in even larger numbers, amassing at least 200. 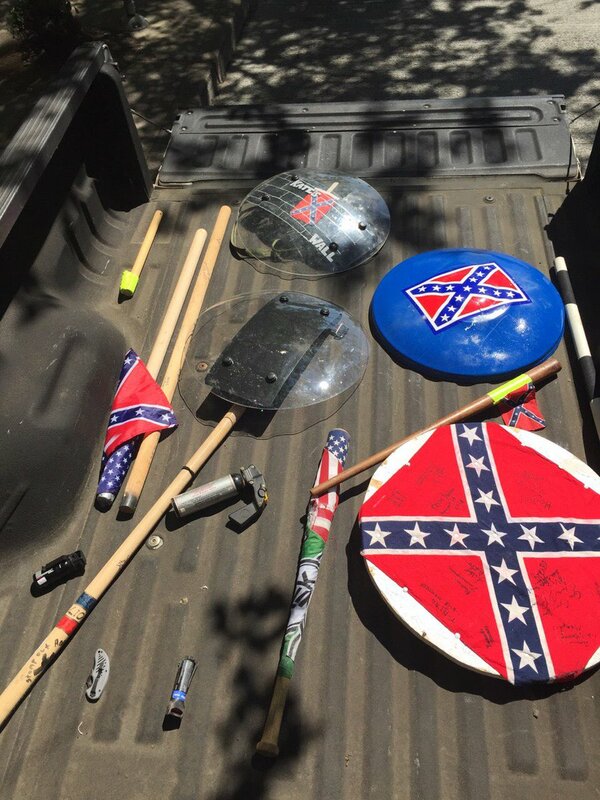 They came bearing weapons and armor adorned in American, Anti-Communist Action , and Confederate flags. This group was a clear embodiment of a street fighting reactionary tendency that has dreams of a murderous social cleansing either by their hands or by the hands of the state. However those who dream of death camps and border walls did not go unopposed, over 1,000 boisterously rallied against their brands of white supremacy and ultra-nationalism. There were people holding signs, passing out water, passing out food, playing music, standing-by to medic, having conversations, giving sweet gestures of support like pats on the back, and in front of this massive rally was one of the largest, hundreds deep, and best equipped Black Blocs Portland has seen in over a decade. There was a sizeable turn out of the infamous Portland anti-racist skinheads many of whom sew fear into the hearts of Proud Boys for good reason, some of these skins have cut their teeth beating the piss out of hardened Neo-Nazis and have on many occasions given cause to say, “Ain’t so proud now! Are ya boy?!”. This anti-reactionary coalition was brought together by local anarchist, communist, antifascist, and leftist orgs as well as their regional and national comrades utilizing a respect for a diversity of tactics and without compromising ethics in the name of left unity. This was also a part of a larger national organizing effort against increased and coordinated reactionary activity in August throughout the US. There was also a third coalition attending this event; a coalition known as Law Enforcement. Sheriffs, FBI, DHS, Portland Police, were all present. They set up a barricaded off area for the Patriot Prayer rally and created a line of armored stick and projectile weapon wielding riot cops keeping the opposing rallies on either side of the street. 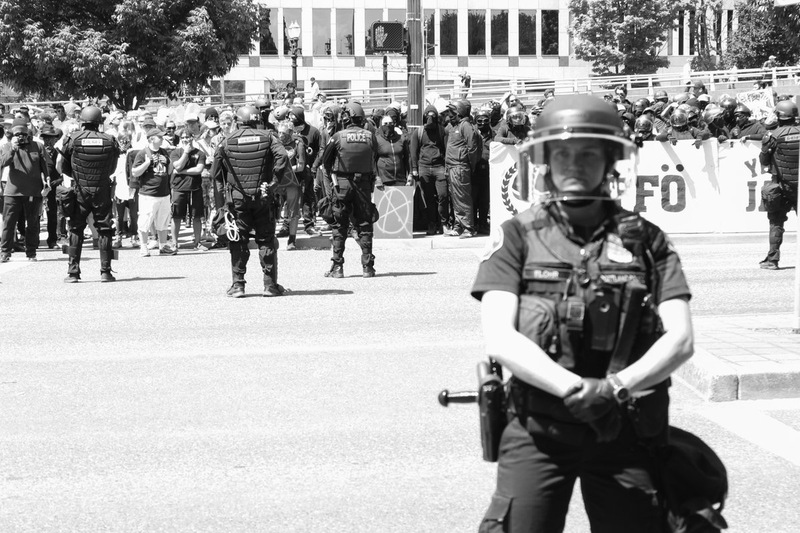 From the start they were clearly there to protect Patriot Prayer and harass the communists, anarchists, antifascists, and others. This is to be expected. One group loves the police and their world and the other group to put it mildly is not really loving the police and their world. 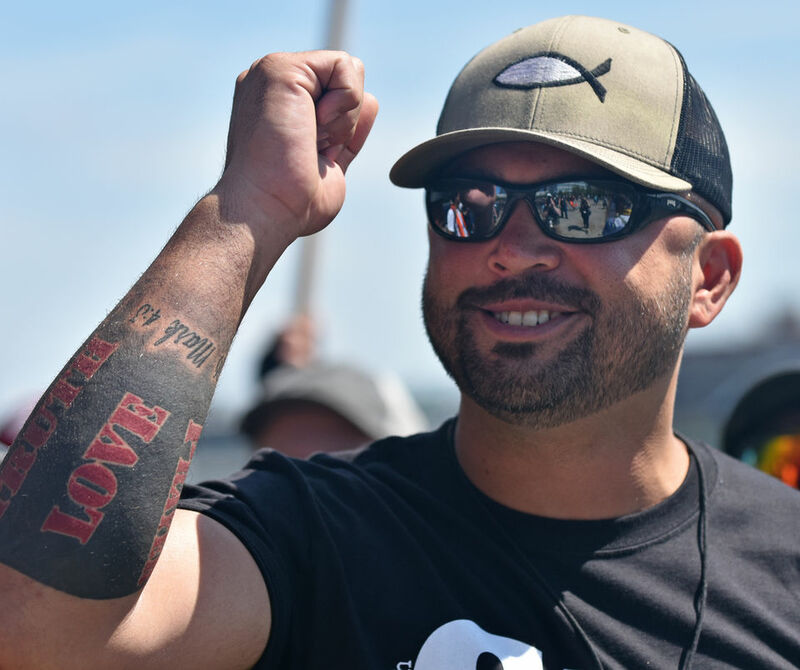 Joey Gibson has even gone so far as to claim he cut a deal with the police so that they could march and remain armed. Even the city auditor admits preferential treatment. 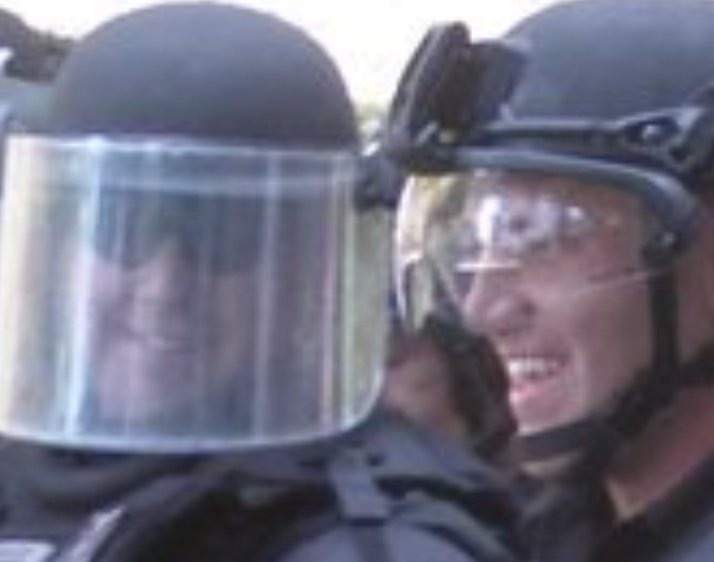 And let’s not forget that Portland Police have actual avowed Neo-Nazis in their ranks. The Bloc(s) seemingly paced back and forth like tigers in a cage, many shooting the breeze, cracking jokes, milling about with the rest of the rally goers, and building affinity with a more dynamic array of others. Prepared to wholeheartedly defend their comrades and other anti-reactions, some in the bloc visibly yearned for revenge—their fingers restless, their fists tightening sporadically, and determined ferocity in their eyes. I could sense that we were remembering ourselves. For all the disparaging of the ritualistic nature of Black Blocs, I have yet to find another ritual more desirable than running around in black with one’s comrades looking for emergent possibilities to build affinity, strike at one’s enemies, and to protect that/those which/whom you love. Reactionaries occasionally made their way to the “antifa side” and some got their flags taken or received blows to the head and face, there was seemingly little possibility of an all out clash with the police separating us. 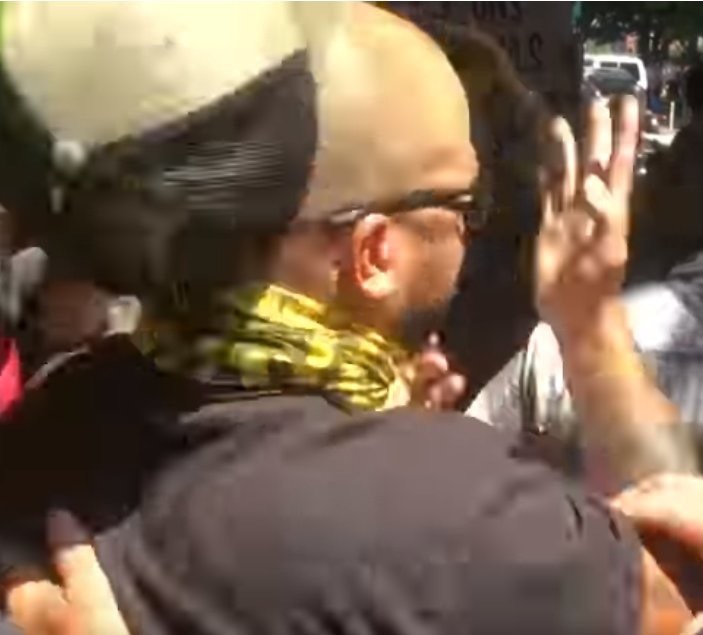 Antifascists and others also made it over to the Patriot Prayer side throughout the day some get attacked for arguing, others stealthily infiltrating, and some pulling pranks like Joey getting his hat snatched. After Patriot Prayer et al started to move from their initial rally point so did the Bloc. Chills went down my spine as the Bloc began to march in hopes of out maneuvering the police, heading off the reactionaries, or at least being able to rumble with them. At one point two large Blocs met up, chants of “Alerta! Alerta! Antifascista!” rang out and the pacification accumulated after of living between such events melted away. Eventually we caught up with the reactionaries, but sadly we also caught up with a line of riot cops protecting them. When the police attacked they were met with a rain of bottles and rocks. There was no longer a need to avoid attacking police, the crowd turned the weapons it had been saving for the reactionaries against the line of cops, who are responsible for a level of white supremacist violence the other fascists present only dream of. 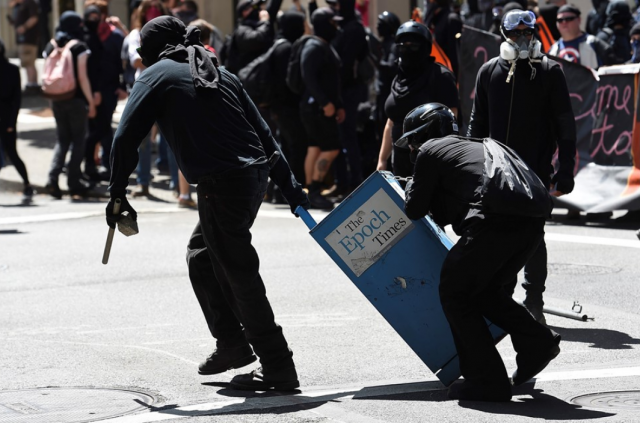 The Bloc not only used the offensive and defensive tools they had brought, they also used city itself as everyday objects like trash can lids or news paper boxes and looted materials from construction sites were used for melee weapons, projectiles, and barricades. The police may have moved in occupy the capacity of the Bloc to help Patriot Prayer move away from the rally area as the cops did in Seattle at the UW at a previous Patriot Prayer rally. Maybe the police narrative is correct and they moved in to get to their cars which the bloc happened to be eyeing keenly. It is also possible they had cause to beat up some reds and long-hairs and didn’t want to pass that up. Why at this point may be hard to pin down, but what is clear is there was a bias towards protecting the reaction and attacking the anti-reactionaries. The truth is the police lack the equipment, numbers, and surveillance infrastructure to actually uphold the lie of social peace. They require people to behave like good citizens and listen to the cop in their heads. So much more damage could have been done down town. In prioritizing protecting the reactionaries Law Enforcement left much of the city free from the modicum of control they exerted over it. In Berkeley the next day the antifascist bloc took the opportunity to attack a Marine Recruitment with little consequence, Portland could have taken such an opportunity there were plenty of Banks and the like just asking to be beautified. Perhaps people just weren’t interested or had some foolish idea that people would actually mourn a few corporate windows to such an extent as to remove all our popular support, but I am of the opinion that people didn’t realize how much could have been gotten away with. There was a myriad of more barricade supplies and rocks that could have been used as well. 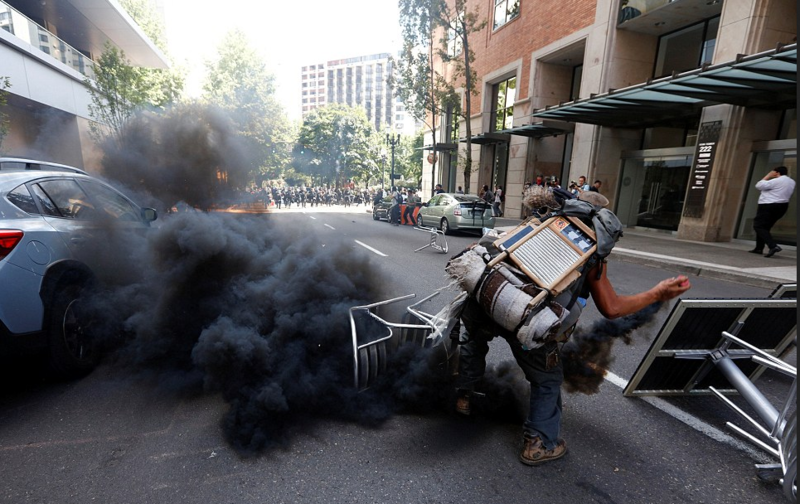 The Bloc itself also took the attention of the police, a Portland Police spokesperson said, “It was a significant drain on resources city wide.” They seemed to have sent almost all their cops. So hopefully others were able to take advantage of this situation and at the very least typical police habits such as harassing houseless people ceased if only for part of a day. We did our best to defend ourselves and our comrades, but after a few beautiful and harrowing minutes the police were eventually able to push our group back and scatter the Bloc. Our side sustained injuries as well including a head wound from a police projectile that would have been fatal if not for a helmet and some hospitalizing injuries sustained during brutal take down arrests. One woman got 3rd degree burns from a police grenade. One comrade was nearly crushed under a reinforced banner during the police charge. There were also other injuries and reports of a 13th month old baby being maced by security at city hall. On a semi-related, but important note there were also some bad throws from our side that came close to hitting comrades. It was clear the police successfully protected the Proud Boys and Patriot Prayer’s rally. This being said some socialists managed to get into the reactionary march and troll the crap out of them. It is also clear that antifascists and their comrades were not able to totally prevent reactionary violence against targeted groups. Though it could have been worse if the Bloc didn’t show up and probably would have been and there was much gained in experience and practical defense there were still brutal attacks. After the Bloc largely dispersed Proud Boys, including Tiny, beat the crap out of and pepper-sprayed non-white youths throughout the area. However, there were also numerous occasions where Proud Boys were beat down by comrades, frightened reactionaries were ruthlessly harassed all the way to their cars, and their god, their guns, and their wall failed to protect them from the sun. Aside from an apparent hubris when it comes to thinking water is for the weak and a strong man can take on the sun, there was also a physical fight between the reactionaries themselves that broke out over who knows what. They have many weaknesses we can perhaps exploit. We can push on their divisions to turn them against each other, use their over-confidence against them, and so on. Patriot Prayer and the Proud Boys have pulled out of the main rally in Berkeley, implicitly because it’s run by a woman who isn’t submissive to them, but also because a less PR savvy White Supremacist patriot group American Guard is a part of it. Someone should tell Gavin and Joey that Tiny is a supporter of said group. Perhaps stoking these fights among them is worthy of our time. There are already splits emerging over what side of conspiracy theory world, as well as splits between ZOG-fearing anti-Semites vs Israeli Occupation supporters, classic all-American reactionaries vs more edgy Neo-Nazis, and so on. How can we act more critically and effectively to neutralize this reactionary movement and build our own projects? Let’s continue to think about the terrain both social and physical, let’s continue to think logistically****** about the situation, we seem to know information is useful yet we can do more to sort thru information as well as act on available information such as doxxes, let’s think about the tools available to us that we can bring or find, let’s think about our movement and how to move better both too and from spaces as while as maneuvering effectively during action, let’s think hard about our goals—even if they’re vague or petty or hedonistic—and if our actions will actually accomplish them, let’s try and learn yet not let lessons from the past clobber our current projects, and here, speaking to my comrades, let’s not lose sight of our anarchist desires in the wash of opposing the fascists, the bigots, or our many lesser enemies. Being proactive and continuing our anarchist and anticapitalist trajectories will expand our capacities in general as well as for defense against and neutralization of ‘the reaction’. Let’s not forget that the whole reason the reaction exists is in response to the growth of radical projects. They want to beat and kill us because we’re communists, queer, uppity non-men or non-whites, and because we’re anarchists. They want to beat and kill us because they see us as a fundamental threat. Lets embody this fundamental threat and in doing so let’s also engage in ways they have closed themselves off to. Let’s love and care for each other so we can truly be dangerous together. Finding comrades doesn’t just mean chucking rocks at cops with someone. It means taking care with each other, it means defending people from attack, and it means be careful to minimize harm to those who are not our enemies. It means taking care before, during, and after. It means being brave and vulnerable enough to check in with a stranger who seems to be in distress during or after an action. Let’s make this world more dangerous for those that wish us and our loved ones harm. We can find new friends and comrades and increase the possibility of encounter without watering ourselves down. Many anarchies and many worlds can exist and overlap with each other and in coalition we can use our mutually aid and defend one another. Let’s also keep taking care with and building affinity with our old friends. Let’s continue loving the home cooked meals we share or tender touches. The bitter tasting tinctures and goofy antics. Let’s break down arbitrary compartmentalization and let our loves and joys and the everyday slosh up against our fears and hatreds and the exceptional moments. Let’s remember there is more to this all than just the streets. We can be tender with each other and also know when to protect ourselves, know when to be spikey, know when to not give into sacrificing ourselves for some imagined “greater good”. It’s not a matter of sacrificing more for “the cause”, but a matter of being more more greedy, smashing more and better, sabotaging more and better, stealing more and better, sharing more and better, fighting more and better, continuing to burst out laughing, continuing to love, and all only when it is radically desirable. Let’s press on toward more moments of fleeting insurgent anarchy and not let the opportunities for attack and friendship made more visible after socially rupturous moments fade without acting on them or keeping their spirit alive. Let’s take so much advantaged of the situation that it feels like we’re cheating. Remember that these street-fight ready reactionaries don’t always exist in the street, they have to get to the streets, they have places they hang out in, they have to go home. Remember there are multinational corporations and gov’t orgs destroying the earth, brutalizing communities, locking people in cages, and raining death upon ways of life. These groups also have logistics and take up physical space. Our enemies are the ruling order and its reactionary defenders. Our enemies are the State, the ruling class, and the police who uphold their will. Our enemies are the apparatuses that subjugate life in this hellworld. We are in an age of brutal camps and militant reactionary street movements. Our grievous wounds given to us by our enemies are viscerally evident. We know we want; to fight them and build our power. How is it to be done? For those still itching for a fight, find a good one. For those looking to become more creative, do it. PS Cheers to the comrades who dropped banners, made other good hype media, and also those who showed love from other cities. We appreciate you!! *Reactionaries are basically those defending normality and the oppressive status quo or parts of oppressive the status quo from perceived threats such as communism, LGBTQ, Black Liberation movements, and other such transgressions against straight white capitalist nationalist ruling order though sometimes This group of reactionaries was an overlapping amalgamation of Proud Boys(Western Chauvinists), White Nationalists/Supremacists, Neo-Nazis, Neo-Confederates, anti-communists(including Anti-Communist Action), patriot/militia types, Christian Supremacists, militant neoliberal capitalists, queer and trans phobes, paleo-conservatives, alt-right types, “conspiracy theorists”(Q conspirators and InfoWars were present), and so on. People who had attended the deadly Unite the Right rally in Charlottesville were also in attendance as well as some who are planning next years Unite the Right 2. 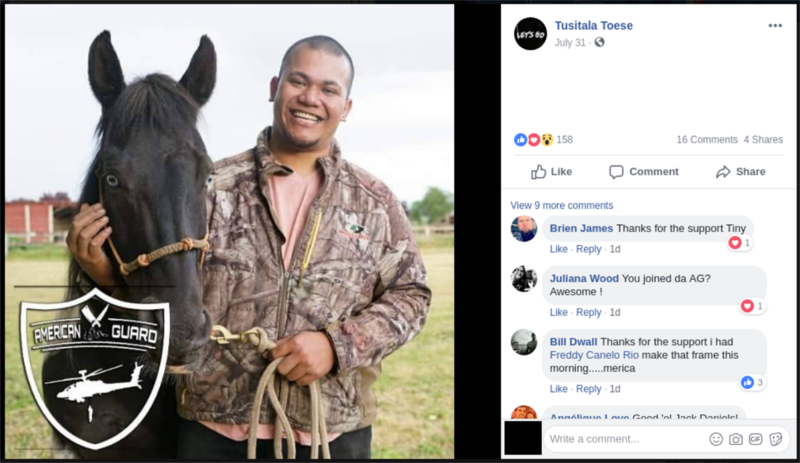 ** One important shift in the Patriot Prayer group is their lieutenant Tiny’s and the Proud Boys’ embrace of the legacy Pinochet. At the rally Tiny was wearing a shirt that said Pinochet did nothing wrong and RWDS on the sleeves a shirt which is being sold by the Proud Boys online. For those who don’t know RWDS is an acronym for Right Wing Death Squads and Pinochet was a dictator in Chile put in power by a reactionary coalition of authoritarian Catholics, global and American capitalists, and right-wing nationalists(including a handful of Nazis) who is responsible for the slaughter and torture of tens of thousands of people ranging from liberals, people deemed religious deviants, union members, feminists, socialists/communists, artists, petty drug dealers/users, and so on. Click here to see Tiny defending the slaughter of 35,000 because they were all supposedly communists. It’s important to note a comparison between Patriot Prayer and other authoritarian bigoted groups like the BJP, ruling party of descended from the Nazi inspired RSS. The BJP’s leader Modi says inflammatory things occasionally, but is primary a politician who tries to keep his nose clean and toe the PC line. But if you watch what he actually does you find a bias against targeted groups like religious and ethnic Muslims as well as a clear allegiance to capital over the well-being of the South Asian land and peoples. And if you watch his lieutenants and what he makes space for a clearly violent Islamophobic street movement can clearly be seen. Now of course Joey Gibson and Patriot Prayer are no where near as powerful as the BJP, but the caparison of a violent political movement with a PR oriented leader whose group makes space for, and whose lieutenants encourage, a violent bigoted street movement. Joey himself has said Portland needs to be “cleansed” which is pretty on the nose as far as PR-saavy statements, but perhaps Joey is also part Trump. **** It is also perhaps important to note that they don’t see Portland as their city and in fact often point to Portland as some sort of epicenter of undesirables so it may not actually be normalizing their presence that they’re looking for. *****This is not say we’d want police to exist if they were impartial enforcers of some arbitrary law and treated all sides equally. They would remain an obstacle to the actualization of our desires regardless of doing a more ideal job. ******Logistics are basically the infrastructure of a system or operation or project or whatever. This means transportation, communication networks, where they get their funds, and how they keep functioning really. Note that there were phone jams and prank calls targeting the Proud Boys and Patriot Prayer leadership building up to the 4th.